This frosting is just the right mix of sweet and creamy. It isn’t over the top sweet, so it compliments the sugar cookie very well. It is also very smooth, so there is no grittiness to the frosting. I love decorating cookies, so having a frosting that firmed up but remained soft is very important to me. With this frosting, you can stack cookies in cookie tins, wrap them up, or put them in treat bags. The frosting is firm enough to do this, but it still remains soft and creamy. This frosting is also very easy to make. All you have to do is cream softened butter and confectioner’s sugar together. Then you add milk and vanilla. That’s it, and you are just two simple steps away from a delicious frosting. Even Samuel loves this frosting, and he is not very keen on frosting on desserts. This frosting recipe makes a lot of frosting. So unless you like thick frosting on your cookies or you are planning on making a few dozen, I would halve the recipe. I made around 30 sugar cookies and still had over a cup of frosting left. This frosting firms up well, so don’t be too concerned if the frosting seems thin. If you add too much confectioner’s sugar, it will taste strongly of it. I prefer to have a nice vanilla flavor in the frosting, and I don’t like when you can clearly taste the confectioner’s sugar. This frosting takes just minutes to whip together, and it tastes deliciously perfect on a sugar cookie. Cream together butter and confectioner’s sugar by adding one cup of confectioner’s sugar at a time to the butter. Beat until confectioner’s sugar and butter is smooth. Add in the milk and vanilla. Beat again with mixer until smooth and stiff, approximately 5 minutes. Add in optional food coloring if you’d like. Frost sugar cookies and enjoy! The frosting may seem soft, but it does firm up so you can stack the cookies. You won’t need to add additional confectioner’s sugar to this. You will need to leave the cookies out to firm up for a little bit after decorating. I leave mine out for up to 30 minutes. The frosting firms up so you can stack them, but it stays soft and creamy at the same time. This recipe does make quite a lot of frosting. I recommend halving the recipe first so you don’t have a large amount of unused frosting. I have frosted about 3 dozen sugar cookies with the full recipe. If you like your frosting thick, the whole batch of frosting may work fine for you. If you prefer thinner frosting on your cookies, definitely halve the recipe. I love your blog! Your foodie posts are all so amazing ❤ I can't wait to read more from you! 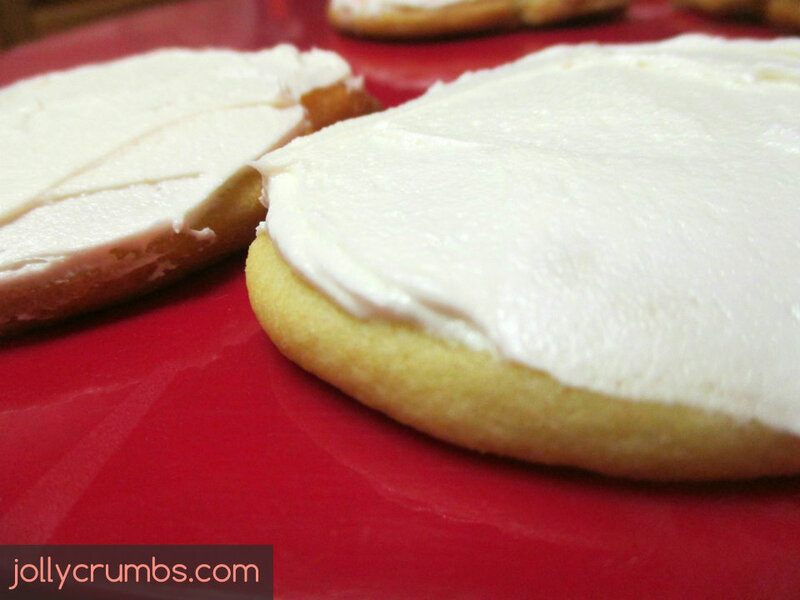 I love, love your sugar cookie frosting recipe!! It is extremely yummy and very user-friendly. You are so right, jollycrumbs… it does not taste like confectioners sugar…it was perfection! The entire recipe was enough to ice 4 dozen cookies. I will be making this again and will be sharing. My family gives this a BIG thumbs up! Thank you!